9 registered (DrLuke, sprkplug, bigbambo, JWF, roundy, Shorty, mbunimog, Theo Gallus, Snicholas), 187 Guests and 627 Spiders online. Ok All you fly fisherman, any suggestion on a fly that will help me catch some of the smaller lmb in the pond? I have been to u tube for fly tying but not a lot of luck with catching the smaller lmb. I have caught a couple of 14" to 15" lmb, not many but a couple so I returned them to the pond. I am just thinking I may need to do some thinning out this summer. I haven't done any bass bugging in a long time, but we used to have a lot of luck with the bumblebee pattern popping fly. Black with gold stripes and solid white. A hair frog is usually pretty productive too. I have always been told to match the hatch. What flys are in season at the time. 7/8th of an acre, Perch only pond, Ontario, Canada. Not much better at catching 3-10" lmbs than a #8 or #10 olive or black wooly bugger. Streamers are effective...color unimportant - just rip and fall rip and fall. Small crawfish imitators might work, especially if you have lots of them in the pond. Tracy, when I really want to catch lots of small LMB, I've found that a 4 inch jigworm works very well. Occasionally you'll get a big BG, or even a big LMB, but mostly LMB in the 6 to 12 inch range. I always adjust my fishing tackle to meet the size fish. And I have never had to remove small lmb from the pond. Fact is it took me three yrs at the pond before I ever saw a small lmb in the pond. So my thinking is if I need to remove some small lmb then fly fishing might be a fun way to remove them. I started fly tying last year, not very good at it, fact is my fly's look sloppy when comparing them to other's but I have caught fish on them. And that is kinda of rewarding. It's just my fly's catch bg and not so much small lmb. We had a very rainy day yesterday so I took my yr old Golden Retriever with me and went to Bass Pro Shop. A year old Golden needs to get out of the house and so did I. I purchased some top water plugs for my fly fishing. I don't know how to make those so I bought a half dozen. WOW! 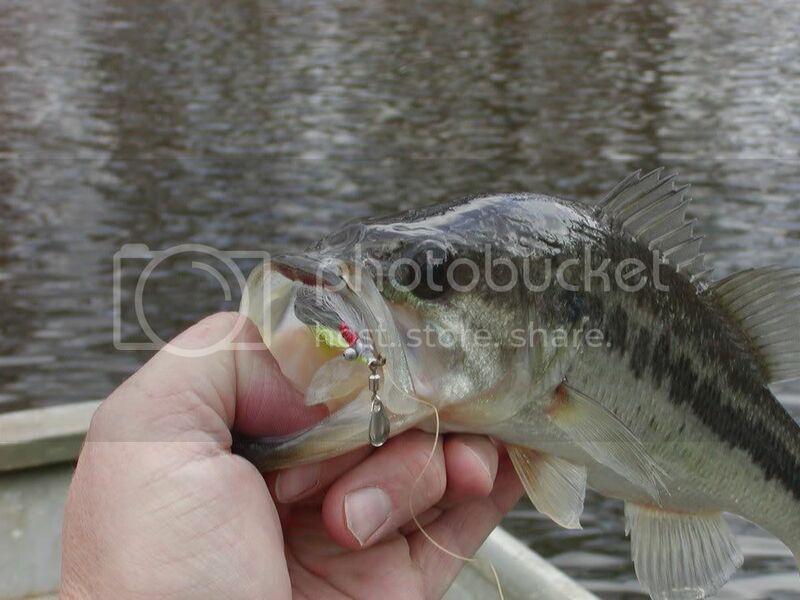 prices were high with fly fishing tackle and I need to learn how to make these type baits. Anyway, I am going after these small lmb with the new poppers. See this from the best. small LMB caught 12-31-05 on the $ Gill George made. Not big but a lot of fun. Thanks again George !! This. The clearer the water, the faster the retrieve. Eric, George used a bent shank hook, IIRC it was 60 degrees, to tie Lady G’s $-Gills. 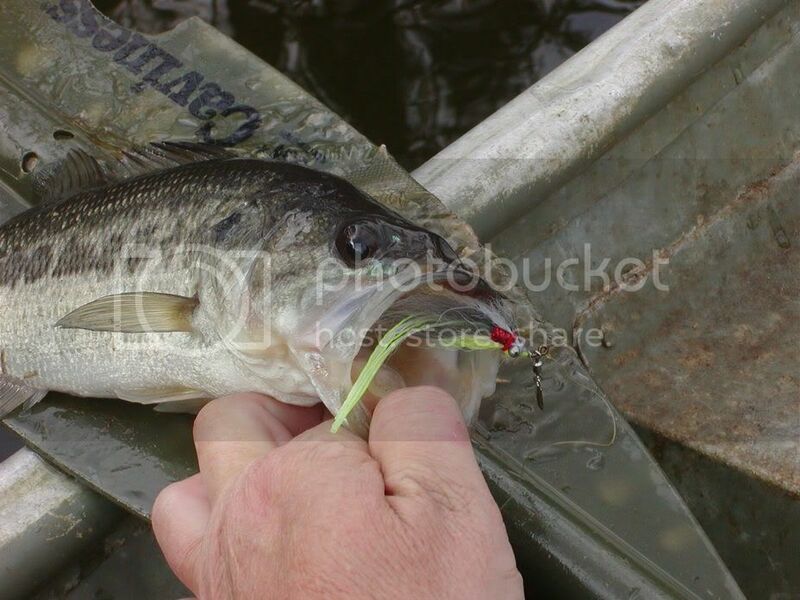 He felt like setting the hook would force the barb straight up into the upper lip like the pics you posted. 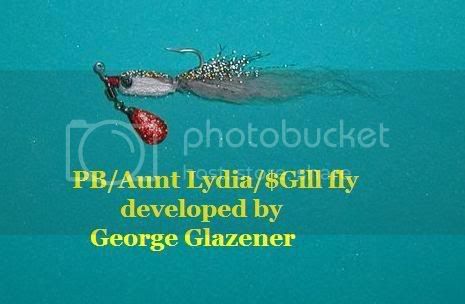 Thanks for posting the picture of George's bent shank, spinner bait fly (streamer). I can see how the bent shank hook works. Haha, another bait to build on a rainy day. And the little 3wt rod makes it fun. The full lineup as presented at the PB Convention. Hey Tracy - Some of the flies ewest posted are very useful, some will just attract your BG; while this is fun, it will become an annoyance having to strip in line to release them and recast for your target small bass. ewest basically covered the holy trinity of bass flies: smaller clousers (color is largely unimportant at teeh pointed out), wooly buggers with slightly larger hooks than your standard trout buggers, and small to medium-sized poppers. 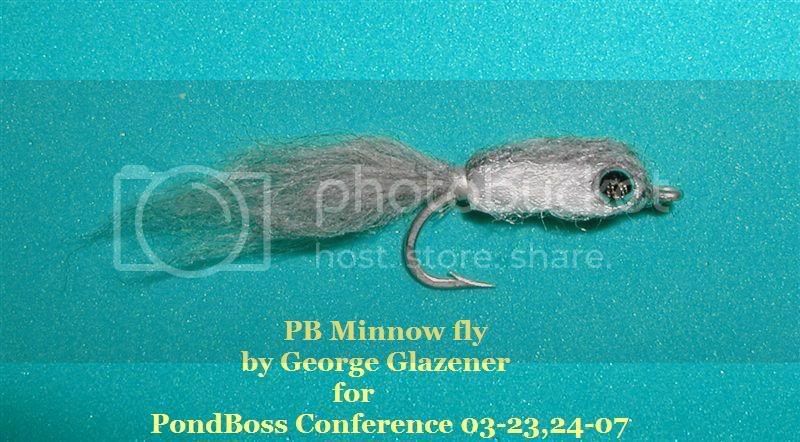 But one other fly I have also had success with is a mylar tube fly that has been UV glued or epoxied in some way with a light plastic lip on the front. It is a top water fly that dives when stripped. 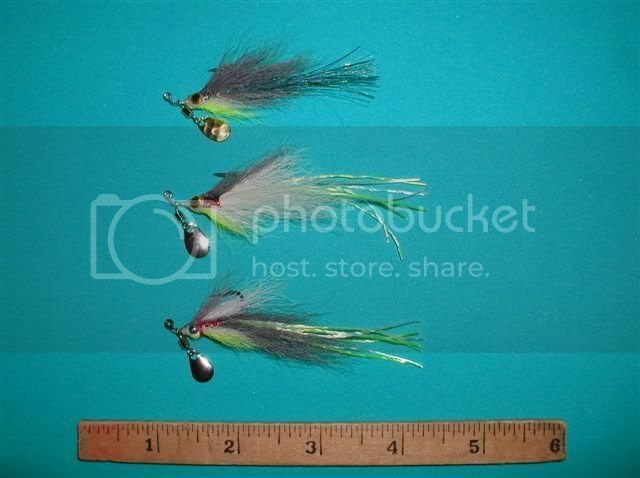 Also a fun variance is to tie or purchase an Enrico Puglisi style baitfish fly using EP fibers. They can imitate a wide range of forage fish including shad, bluegill, minnows, you name it. Just use a big size split shot above your blood knot, ideally 6-12 inches above the fly to help it sink. 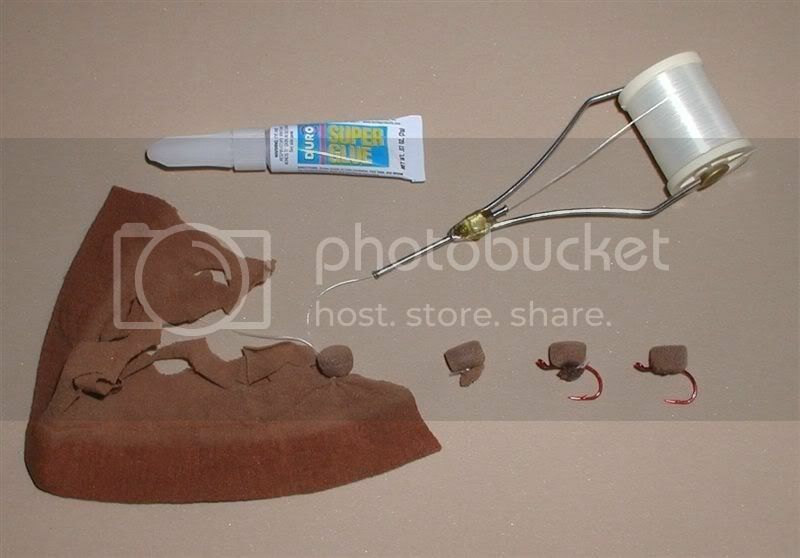 Sink tip lines and/or sink tip tippet also helps to be at ideal depth. Also I have had *some* success with a redfish spoon fly. Bass will eat almost any fly that you would use for redfish. Tight lines! Thanks CC, the mylar tube fly sounds interesting. Enrico Puglisi sounds a little over my head, I have trouble even pronouncing it And I will look into the redfish spoon fly's. Tracy, CC was right on point about EP flies. They're worth the money. Top pic is of a new EP Mullet fly. Second pic is what used to be a Bluegill #1. I caught back to back pond records on this particular fly several years ago. It looked a lot better when it was new in the slip sleeve. Fire - Sweet! What were the two pond records you caught? 2 LMB off the same brush pile. IIRC, they were 6.5#, and then a 7.5# right after it. The actual numbers are in an old post, but I think the 2 were right at 14#. I caught them on a 5 weight, so we had a tussle before I finally got them in. Congrats on two great fish on the 5 weight! What a feeling.